I decided to do something exciting and challenging — I guess most of the big things we do usually are. I am doing Tour de Friends and have made a commitment to raise at least $2500 to support the fight against AIDS. 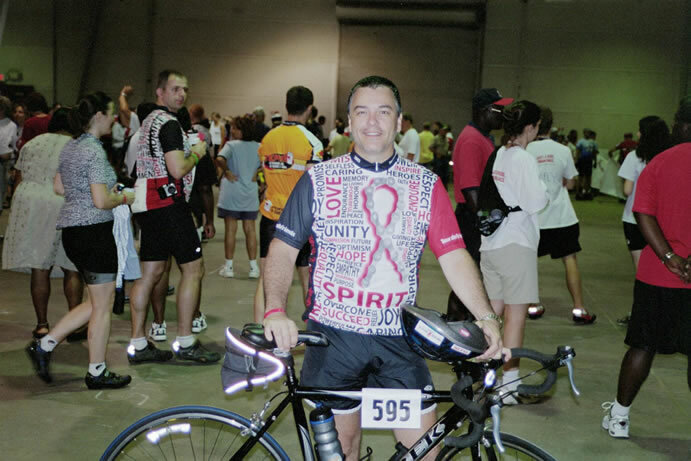 If I meet this goal by May 21, I will join almost 2000 others in biking from Raleigh, NC to Washington, DC (330 miles over the course of four days—June 19-22, 2003) to raise awareness of the need for all of us to recommit to our battle against HIV/AIDS. I say recommit because there is a notion today that AIDS is not as bad as it used to be, that it is easy to treat, and not all that hard to live with — or even that it is over. The reality is that after two decades there is still no cure in sight, rates of infection are increasing, and there are over 1 million people living with HIV/AIDS in the US alone. The fight against AIDS in our communities is far from over. Obviously, I can’t do this without your help. So, would you please consider sponsoring me? Even $5, $10, or $20 would be a big help. A pledge of $25 (or more of course) would almost get me to my goal, counting on the number of people I hoped might be willing to support me. You were one of them. Donations must be received by May 21, and they are tax deductible. I have donated $100 of my own money in addition to the $75 rider registration fee, and my commitment to train, ride, and fundraise. I’m riding for my good friend, Wes, who is HIV+, and is also riding as the team leader of our team, “Team IBM.” I’m also riding for two other friends of mine, one of whom is also living with HIV, and another who has passed. I can’t tell you how much every donation, no matter how big or small, will mean to me. Thank you for your support and for being in my life. I trained from March 2003 until the ride in June. I thought this was a wonderful gesture, shared it with the rest of my supporters, and so added some people to ride for just for “positive energy in their lives” See the list I carried in my pocket throughout the ride. Before I left on the ride, I received many good wishes. Click here to read some. I carried a tape recorder with me during the ride, and remembered the days in my journal shortly after the ride was over. To hear the voice recordings, read my diary entry, and see some photos of each day, click on the respective days below. After the ride, I received many congratulatory notes, and shared reflections on the ride by those who participated in it.